Victorian watercolours were among the first works of art to be purchased for the fledgling Art Gallery of New South Wales almost 150 years ago when the Parliament of New South Wales provided a grant of £500 in 1874 ‘towards the formation of a gallery of art’. Now, after decades in storage, over 80 beautifully restored works will be presented for six months in the Gallery’s Grand Courts in a crimson-walled Victorian setting complete with sash curtains, palms and period-style seating. Dr Michael Brand, director of the Art Gallery of NSW said Victorian watercolours is a celebration of these formative acquisitions for the Gallery, complimented by exciting recent watercolour acquisitions including Charles Altamont Doyle’s The spirits of the prisoners c1885 and Andrew Nicholl’s A distant view of Derry through a bank of wildflowers c1830s. “Victorian watercolours are indelibly associated with the history of the Gallery during its early years, and these evocative works are bound to surprise and delight in this grand architectural setting,” Brand said. Peter Raissis, curator of European prints and drawings, noted that Victorian watercolours were greatly appreciated in their day and were painted in a highly finished style that was intended to match the achievements of oil painting. 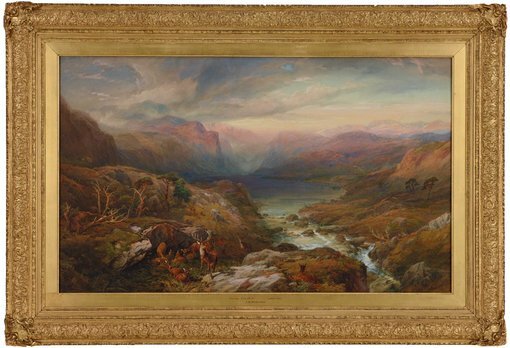 “Watercolours by living artists were actively acquired – mainly in London, but also in Sydney, Melbourne, Adelaide and New Zealand. “Among the ranks of Victorian watercolourists are important and esteemed artists as diverse as Samuel Palmer and Dante Gabriel Rossetti, as well as many minor figures who, though less famous today, are in many cases surprising for their inspiration, originality and technique,” Raissis added. In order to showcase the Gallery’s historic collection of Victorian watercolours, a meticulous two-year conservation project was undertaken. The project provided a unique opportunity for the Gallery’s conservation staff to examine the technical innovations in watercolour production during this era. Many of the Gallery’s watercolours retain their original ornamental, gilded frames and considerable conservation work was also involved in restoring them. Victorian style gilded frames were also reproduced for artworks that no longer have original frames. The exhibition is accompanied by the publication Victorian watercolours by Peter Raissis, the second in a series on European prints, drawings and watercolours from the collection of the Art Gallery of New South Wales. Beautifully designed and richly illustrated, this book features over 120 colour illustrations. While Victorian watercolours is exhibited in the Grand Courts, the Gallery will be lending some of its most-loved European old master paintings to Hazelhurst Regional Gallery & Arts Centre. The old masters will be reinstated in the Grand Courts in December. The Gallery would like to thank the Women’s Art Group for its contribution towards the conservation of the watercolours for this exhibition. Victorian watercolours was also realised through the watercolour frames conservation project which was generously supported by the Conservation Benefactors and individual benefactors Susan Rothwell, the late Joyce Sproat, Ruth Vincent, Philippa Warner, Joanna Coghlan and Liz Laverty.